Nom de plume or Alias? Established authors who change their name on new books they've written is a subject I haven't covered. So when popular author, Carol Crigger decided to make that change, Carol agreed to write a guest blog on the topic. "Why are you changing your name? " a friend asked. "How will I know how to find your books?" "It won't be hard," I assured her. "Im still Crigger, only now it's Carol Wright Crigger instead of C.K. Crigger. Search engines bring either up pretty easily. Carol Wright Crigger is a combination of my maiden name and married name. C.K. are simply the initials of my first and middle names." "But why did you do it?" she asked again. "Why does anybody?"  I'm not 'anybody' so I can't fully answer for them. I can only speculate. 1) They're writing in more than one genre and want to set each apart. 2) Earlier books have been unsuccessful and they're starting over. 3) Their name is the same as another author and readers get confused. 4) Their publisher suggested the change. 5) Their relatives suggested the change. 6) They're avoiding the Internal Revenue Service. 7) They're avoiding a hit squad. 8) They're going into Witness Protection. As for me? I just plain prefer the way Carol Wright Crigger looks on the cover of a book. And yes, a few other thoughts are mixed up in the decision. 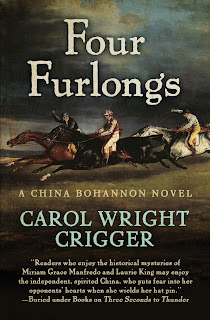 Five Star/Cengage is publishing Four Furlongs, the fourth book in the China Bohannon adventure/mystery series. New publisher equals new name. I've since had a contemporary mystery (Hometown Homicide) picked up by Black Opal Books. Even though the genre is different, I've gone with the new author name for that one, too. If you ran a real survey, I'd bet you'd find the number one reason people vary their author name is because of writing in a different genre. Secondary to that is writing a couple different series. Perhaps one is mystery and one romance. And a literary writer might not want their mainstream books associated with erotica. Or an expose might bring trouble down on a writer's head. Different names give separation. Or maybe denial. One of my long time publishers recently closed its door. They had published ten of my novels, in print and e-book, which are now looking for a new home. They all were written under C.K. Crigger. These books also are all published by Books In Motion in audio. So now I have a decision to make. Go all in with CWC, or stick with C.K.C. I expect it'll be the latter on those older books, in hopes of avoiding confusion. Honest, the IRS, hit squads, or witness protection aren't considerations. Hah! And most people think there's nothing much to this writing business. Bio: Carol Crigger lives with her husband and a raft of little dogs in Spokane Valley, Washington, where she crafts stories set in the Inland Northwest. She is a two-time Spur Award finalist, in 2007 for Short Fiction, and in 2009 for Audio. 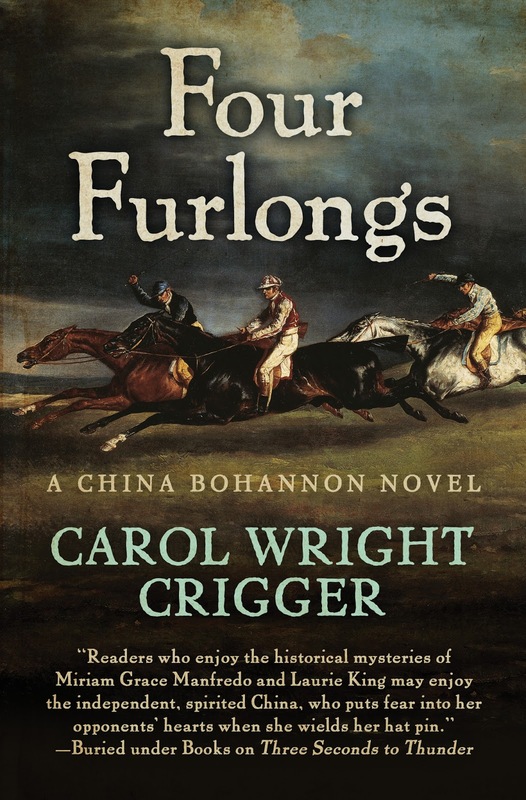 Four Furlongs is available for pre-order on Amazon and B&N. Libraries and bookstores contact FiveStar.Cengage.